"The devil finds work for idle hands"
GODFATHERS can be read on two levels, as a collection of 'true crime' stories detailing the activities of a colourful selection of Northern Ireland's gangsters, drug dealers and paramilitaries. On another more serious, political level it sheds light on some of the darker aspects of the current peace process. Written in a tabloid style by Jim McDowell, the Northern Editor of the Sunday World newspaper, the book was hurriedly brought out as a tribute to the journalist Martin O'Hagan, murdered by the Loyalist Volunteer Force in September 2001, allegedly for exposing their involvement in drug dealing. I have qualms about the style of parts of the book and some of the tactics used by the author. The overall theme is one of good versus evil, the Sunday World and its staff versus the evil pushers. No distinction is made between say cannabis, ecstasy and heroin. No attempt is made to examine why young people are turning to drugs or what possible solutions there might be. The basic stance of the book is 'just say no'. Many of the very serious allegations made against people named in the book are from unattributed sources. Few of those identified have ever been convicted in a court of law and many are no longer around to answer the charges made against them. The book does however provide a disturbing insight into developments in both Republican and Loyalist paramilitary groups since the ceasefires of the mid 1990's. On the Republican side, Sinn Féin and the IRA are keen to retain the role of 'protectors of the people'. At its most cynical, the tactic of killing drug dealers through the front group 'Direct Action Against Drugs' is a vote winner in nationalist areas. Sensitive to public opinion in both Northern Ireland and the USA, the IRA refuse to deal drugs directly, unlike the various republican splinter groups, but McDowell alleges that they 'licence' dealers in Republican areas. Those who refuse to pay end up as victims of DAAD. To maintain a cosmetic distance between Sinn Féin, the IRA and DAAD, and to allow the British and Irish Governments to maintain their pretence that the Republican ceasefire is intact, 'clean' weapons with no forensic history linking them to the IRA were imported from the USA. Three IRA members were arrested and convicted in Florida in 1999 for procuring these new weapons to fight the continuing cold war in Northern Ireland. After the ceasefires, RUC resources were freed up to crack down on the racketeering carried out be both sets of paramilitaries. Always mindful of their public image, the IRA began to invest in legitimate businesses to raise funds. Less sophisticated Loyalist groups, eager to maintain their power bases and lifestyles, and less concerned about their public image, turned to drug dealing. The bloody inter Loyalist feuds of recent years, which were in part fuelled by arguments over drugs are well documented in the book. The story of the Northern Ireland drugs business is unlikely to end in the foreseeable future. 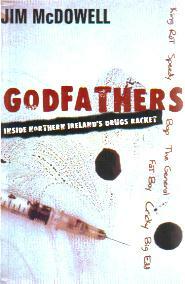 Godfathers details how heroin use has gained a strong foothold in Ballymena and Bangor and an article in the Belfast Telegraph (12th August 2002) claims that the IRA are preparing to reactivate DAAD in the run up to the Assembly elections next year to win back hard-line supporters.